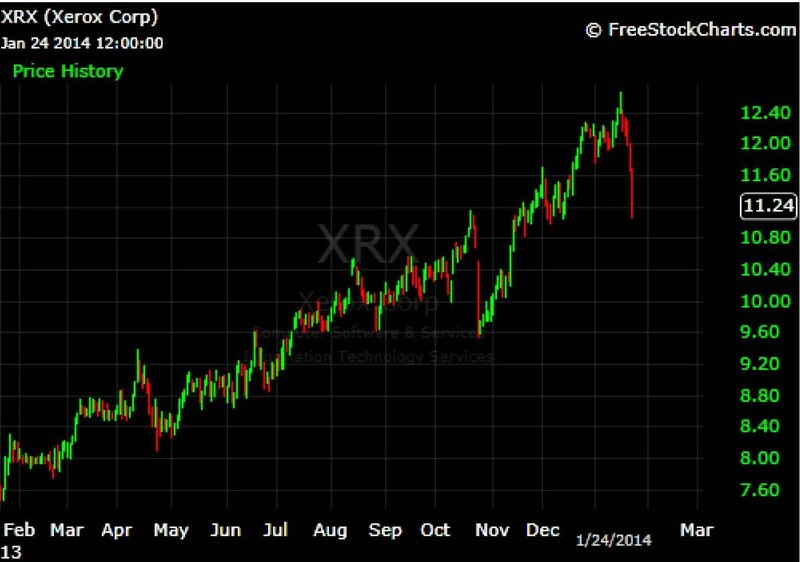 Xerox (XRX) shareholders awoke Friday morning to news of a lackluster quarter. For the quarter ending December 31, total revenues were down 3%. The company's services business was flat while the document technology business declined 6%. As we continue to see Xerox push forward in their transition from a copier company to providing business solutions, investors may find it disheartening that the services segment wasn't able to pick up the slack in the fourth quarter. On a positive note, Xerox did announce an 8.7% increase to their quarterly cash dividend. Although many feel that the dividend increase is a sugar coating on a bitter pill, the recent price decline may present an opportunity for investors. Since I don't have a crystal ball and can't predict whether the share price will return to previous levels or if they will be able to maintain their dividend, we can see one thing; we can see a company transitioning from just copiers to providing complete business services such as parking meter solutions, toll road services, healthcare monitoring devices, etc. Unlike another local company, who recently emerged from bankruptcy (Kodak), Xerox seems to be making a substantial attempt to further diversify their company's business offerings.